Installing a Magic Chef microwave over your range stove is a fun project for any moderately experienced do-it-yourselfer. You will not need to work with any dangerous power tools, but you will be working with an electrical appliance, so it's important that you are comfortable doing so. Turn off the electricity that is running to your kitchen. You should do this directly at the source before you begin this project. 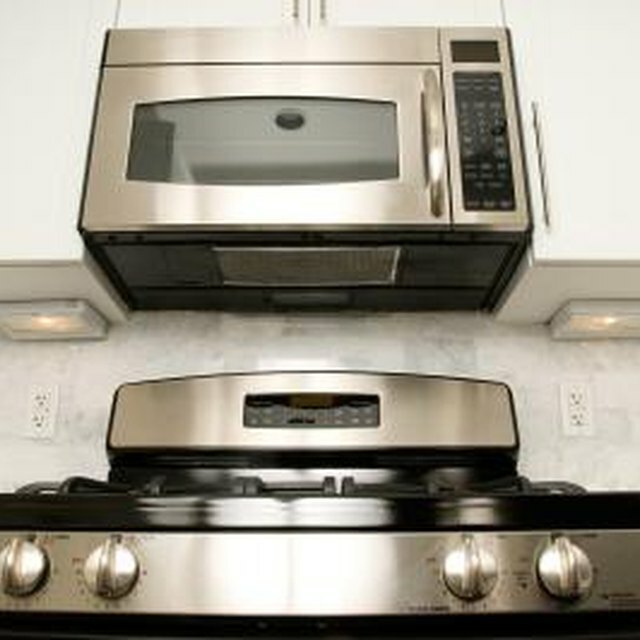 Remove your oven's range hood to reveal its electrical wire. This simply means remove the top of your oven. Most likely, you will have to remove several screws around the perimeter of the range or you may be able to just slide it off. This will depend on the make of your oven. Locate the range's electrical wire. This is what you will eventually use to power your Magic Chef microwave once you have it successfully installed. Remove the wall-hanging plate on the back of your microwave, and use your drill and the screws provided to attach the plate to your wall above the oven where you want your microwave to be. Drill holes into the back off the wall, into the wall studs and also into the cabinetry above the microwave. These holes are going to be where the four bolts, two through the back and two through the top, will go that will be the main support for your Magic Chef microwave. Attach the microwave above your oven using the bolts discussed in the previous step. These will be provided with the Magic Chef microwave kit. As these are the main items supporting the microwave, make sure they are as tight as you can get them. Level your Magic Chef microwave, plug it in and turn the electricity back onto your kitchen. Your new microwave is now installed and ready to go. Return the range hood to your oven. Can a Microwave Affect a Laptop?